WATERPROOFING SYSTEMS based on the placement of a combination of bituminous sheets, which depending on their composition, armour, finish or application method can be successfully adapted to a range of waterproofing projects. Prefabricated sheets made up of one or several layers coated with mastic asphalt, encapsulated (P.AND. film), and non-stick on both sides. This can occasionally be supplied with weather-proof protection on one side. Bitumen derived from the distillation of petroleum, modified with the addition of polymers (polymeric) or other processes (Oxyasphalt). APP: Polymer (Atactic Polypropylene) which is added to bitumen to obtain Plastomeric sheets. High softening point: allows application on hot days. Highly resistant to atmospheric agents: provides maximum guarantee of durability and strength. Good flexibility at low temperatures. (-15o C). SBS: Polymer (Styrene Butadiene Styrene) which is added to the bitumen to obtain Elastomeric sheets. Excellent flexibility at low temperatures (-20o C). Excellent adherence to most surfaces used in construction. Normally APP or SBS polymeric bitumen sheets may be used indistinctly. In hot climates the APP sheets provide easier application. The penetration of SBS at 25o C is 40 mm, while that of APP is 30 mm. Using sheets SBS sheets on roofs with oscillating movement (metallic roofs) or on roofs where adhesion to the surface is a priority (parking roofs) is recommended. Bitumen derived from the distillation of petroleum which has hardened and acquired reduced thermal susceptibility, through blowing with hot air with or without added catalysts. Sheet membrane WATERPROOFING SYSTEMS based on the placement of a single bituminous polymer sheet (LBM). 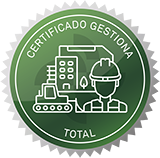 Requirements in accordance with the Spanish CTE technical construction code. Laminate WATERPROOFING SYSTEMS based on placement of a combination of two laminar bituminous sheets (LBM / LA / OXI), with a composition of not less than 4KG/m2 of polymeric mastic asphalt (LBM), per m2 (completed with LA / OXI), in accordance with CTE regulations.